More than any other people found on Urth, humans are the most conflicted, the most paradoxical. They can achieve such wonders and yet can be capable of unspeakable horror. They love with a fierceness matched only by their hate. Most have strong ties to their people, whether those people be religious, political, or familial, but are quick to level a suspicious eye at others who don’t fully share their values, beliefs, or ideals. Humans kill more humans than do the monsters raging across the countryside, the demons that, on occasion, slither free from the Void, or the hordes of beastmen that prey on farms and isolated towns. And it is humanity that is most responsible for the darkness that seeks to smother the world and drag it wholly into the Void. 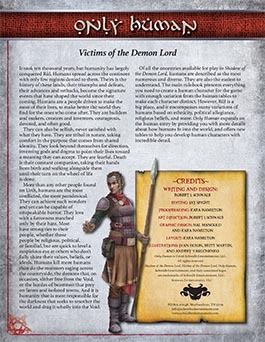 Of all the ancestries available for play in Shadow of the Demon Lord, humans are described as the most numerous and diverse. They are also the easiest to understand. The main rulebook presents everything you need to create a human character for the game with enough variation from the human tables to make each character distinct. However, Rûl is a big place, and it encompasses many variations of humans based on ethnicity, political allegiance, religious beliefs, and more. Pick up Only Human in PDF from Schwalb Entertainment or DriveThruRPG!